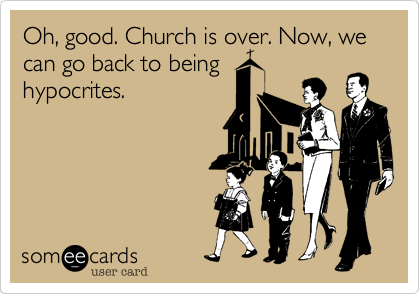 Too many hypocrites in church! sometimes I wonder if there is the need to even preach peace or find means of bringing people together outside church. I say this because majority of the worlds population are Christians. And if Christians are to live by their name, will there be a need to preach peace and love everywhere after church closes? 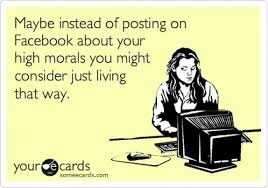 My point exactly is that, Christians talk too much without proving their words by their actions. Yes today is sunday, and we are putting on our holy angelic faces for about 4 hours tops! Some of us don’t even get back home to take off our church cloths before we resume our other lives, we take off the masks right after service when someone mistakingly step on our toes. Can we just quit pretending already? Sometimes I wish I could just read people’s minds to see why everyone present in church is there…I’m sure I will collapse by reading the first 5😅😅. But all jokes aside can we quit posting Godly messages all over social media if we not living by them? Can we quit talking Christianity and do Christianity? If Sunday from 9-12 is the only time we can be holy or close to that, can all days be seen as Sunday and every time be seen as being between 9 and 12? As I said Christianity is a conscious deliberate life lived everyday not only on Sunday’s from 9-12. It’s not easy but if you are willing God is ready to help you live the life desired. May the good Lord have mercy on us all amen🙏. Exactly! I think about this all the time I feel like Christians should lead by example not be judgemental. Great post! Exactly… We must be doers and not just listeners and Sayers!